"Alpha Anywhere enabled us to convert our market-leading Tracker desktop software into an amazing web and mobile system. We’ve reached new clients in new markets and delivered a class-leading asbestos software platform." Start Software is an award-winning software development and consulting business that has been designing and building software since 2006 from offices in the UK and Australia. The software Start Software creates is easy-to-use, fast and reliable. The firm specializes in software for asbestos consultancies. Start Software had developed their successful and mature Tracker asbestos system as a desktop Windows software product. Customers, new & old, were starting to ask whether it was possible to operate the system via the web or on mobile devices. The search was on for a software development environment which could deliver this technological step-change and, after reviewing the market, they chose Alpha Anywhere to make it happen. After reviewing the market, Start Software chose Alpha Anywhere to make it happen. 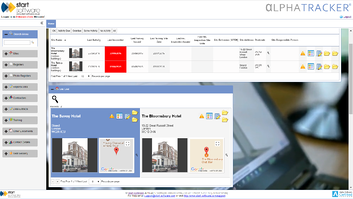 Early versions of Alpha Tracker were developed to pilot at client sites alongside their existing Tracker systems. Both systems could share the same SQL database, so clients could move between the old desktop system and the new web-based system at will. This approach meant that Start Software didn’t have to deliver all Tracker functionality from day 1 – Start Software consultants could start small and build on a solid foundation of features. Start Software developers found that many concepts in Alpha Anywhere mirrored those in the Microsoft development products the team had previously used (Access & Visual Basic, in particular). This helped Start Software developers get up to speed quickly and Alpha Software’s legendary software and developer relationships meant that help was never far away. "Alpha Anywhere does so much of the heavy lifting that we could concentrate on the asbestos-specific functionality. As our team of developers got to know the product they got to love it – so much of what we needed was available with little or no coding." As each release of Alpha Anywhere has offered new features, Start Software has built them into Alpha Tracker and has now published more than 26 major releases of its asbestos software over the last 4 years. Alpha Tracker users are seeing the benefit of all of Alpha Software’s investment in research, development & innovation and Start Software management is confident that the firm can continue to lead the field in this specialist market. With more than 30 million items of asbestos data already captured worldwide, Start Software is looking forward to a great future with Alpha Tracker.